(Nanowerk News) Additive manufacturing, otherwise known as 3D printing, can be used to manufacture porous electrodes for lithium-ion batteries—but because of the nature of the manufacturing process, the design of these 3D printed electrodes is limited to just a few possible architectures. Until now, the internal geometry that produced the best porous electrodes through additive manufacturing was what’s known as an interdigitated geometry—metal prongs interlocked like the fingers of two clasped hands, with the lithium shuttling between the two sides. Lattice architecture can provide channels for effective transportation of electrolyte inside the volume of material, while for the cube electrode, most of the material will not be exposed to the electrolyte. Rahul Panat, an associate professor of mechanical engineering at Carnegie Mellon University, and a team of researchers from Carnegie Mellon in collaboration with Missouri University of Science and Technology have developed a revolutionary new method of 3D printing battery electrodes that creates a 3D microlattice structure with controlled porosity. 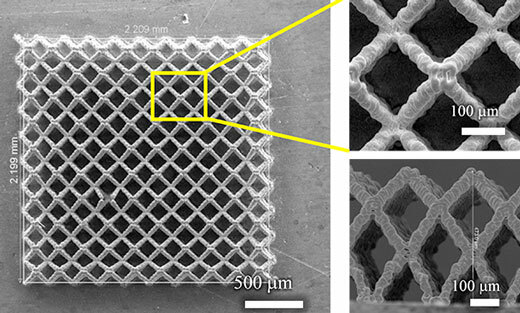 3D printing this microlattice structure, the researchers show in a paper published in the journal Additive Manufacturing ("3D printed hierarchically-porous microlattice electrode materials for exceptionally high specific capacity and areal capacity lithium ion batteries"), vastly improves the capacity and charge-discharge rates for lithium-ion batteries. The additive manufacturing method presented in Panat’s paper represents a major advance in printing complex geometries for 3D battery architectures, as well as an important step toward geometrically optimizing 3D configurations for electrochemical energy storage. The researchers estimate that this technology will be ready to translate to industrial applications in about two to three years. 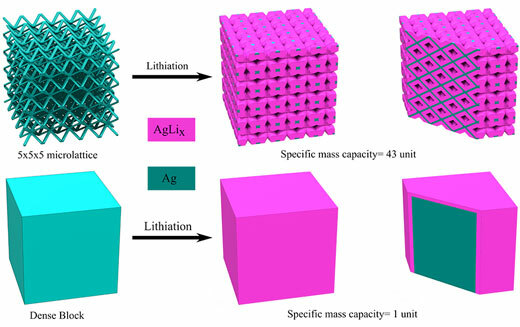 The microlattice structure (Ag) used as lithium-ion batteries’ electrodes was shown to improve battery performance in several ways such as a fourfold increase in specific capacity and a twofold increase in areal capacity when compared to a solid block (Ag) electrode. Furthermore, the electrodes retained their complex 3D lattice structures after forty electrochemical cycles demonstrating their mechanical robustness. The batteries can thus have high capacity for the same weight or alternately, for the same capacity, a vastly reduced weight, which is an important attribute for transportation applications. SEM images of 3D printed electrodes for Li-ion batteries used for electrochemical cycling in the researchers’ study. Image taken from top of microlattice electrodes with height of about 250mm. The Carnegie Mellon researchers developed their own 3D printing method to create the porous microlattice architectures while leveraging the existing capabilities of an Aerosol Jet 3D printing system. The Aerosol Jet system also allows the researchers to print planar sensors and other electronics on a micro-scale, which was deployed at Carnegie Mellon University’s College of Engineering earlier this year. Until now, 3D printed battery efforts were limited to extrusion-based printing, where a wire of material is extruded from a nozzle, creating continuous structures. Interdigitated structures were possible using this method. With the method developed in Panat’s lab, the researchers are able to 3D print the battery electrodes by rapidly assembling individual droplets one-by-one into three-dimensional structures. The resulting structures have complex geometries impossible to fabricate using typical extrusion methods. This revolutionary method will be very important for consumer electronics, the medical devices industry, as well as aerospace applications. This research will integrate well with the biomedical electronic devices, where miniaturized batteries are required. Non-biological electronic micro-devices will also benefit from this work. And on a bigger scale, electronic devices, small drones, and aerospace applications themselves can use this technology as well, due to the low weight and high capacity of the batteries printed using this method. The team, which also includes mechanical engineering Ph.D. student Mohammad Sadeq Saleh and postdoctoral researcher Jie Li (Missouri University of Science and Technology), is also working on creating more complex three-dimensional structures, which can simultaneously be used as structural materials and as functional materials. For example, a part of a drone can act as a wing, a structural material, while simultaneously acting as a functional material such as a battery.